I've been introduced to this website recently, BookUp.my which triggered my interest as it works to resolve the current dilemma that the majority of students in Malaysia are facing in recent times. In fact, a decade ago I was already feeling the heat of expensive university textbooks, and the only workaround that time was to source from outgoing seniors and sometimes that's hard to come by. Textbooks are actually pretty expensive and at the end of every semester, students may have no use of it. This is not applicable to all though, some may want to keep it for future reference, but that's another story all together. Some of us give it to juniors, but most of us kept the unused textbooks at home collecting dust. We need a better way to clear the textbooks, so that they can be in good use for others who need it. This is actually a win-win situation for both parties, juniors getting their textbooks at a discount, while you get to clear off your old textbooks. BookUp is the project brainchild of two everyday Malaysians that wants to make a difference in the society, more specifically, the students society. What is BookUp exactly? 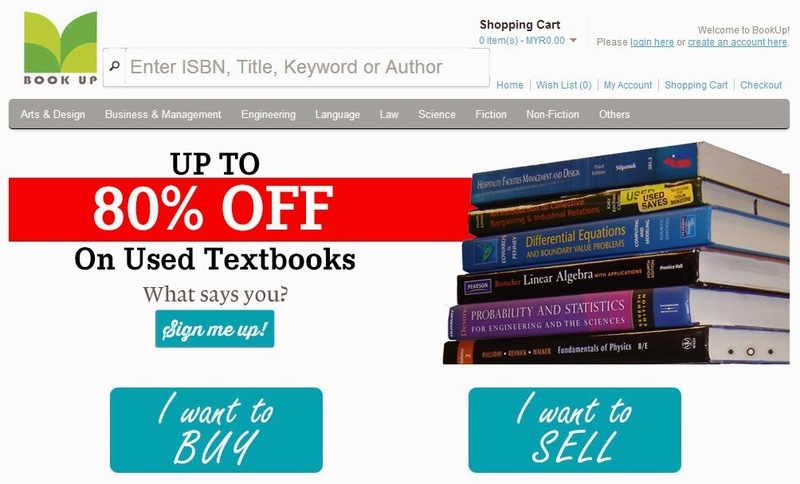 BookUp is a website which sells textbooks as well as books for up to 70% cheaper. Not only that, for those of you who have too many books lying around and have no idea where to sell them, BookUp will handle that for you. To buy books: Once buyer identified the books that they wanted to buy, they just have to complete the payment. Books will then be sent to them. BookUp is currently based in Ipoh, Perak and still in the process of expansion to other states. Starting from January 2014, BookUp will be going around to universities and colleges to engage with students. They can be contacted at mybookup@gmail.com , so do check out their website, which I feel is a pretty good effort to help the students in Malaysia. Sounds great ! Cheaper option to purchase textbooks.